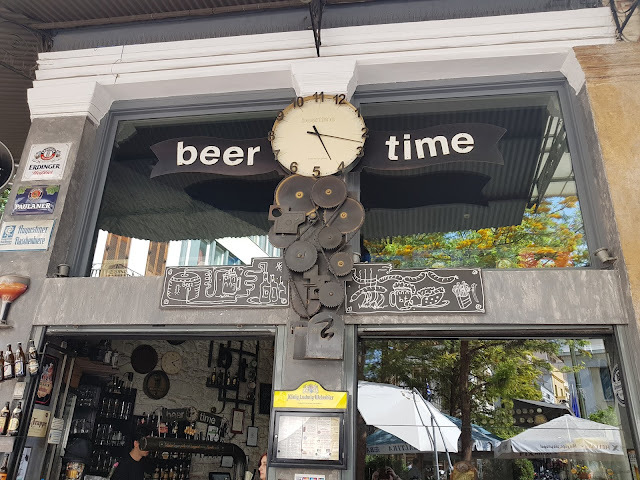 Let's be honest here, I went to Greece with no expectation of beer at all. For one thing, I was on my honeymoon so beer wasn't top of my priorities, spending time with my new wife was. Of course if we can share some beers while doing that, I might as well keep track of what I'm drinking and get a few blog posts put of it. We spent two nights in Athens and you know what? It was just enough time for me. Unless you like wandering around museums for hours, two or three days is more than enough to take in the city. We were very lucky with out hotel as it was right at the foot of the acropolis. 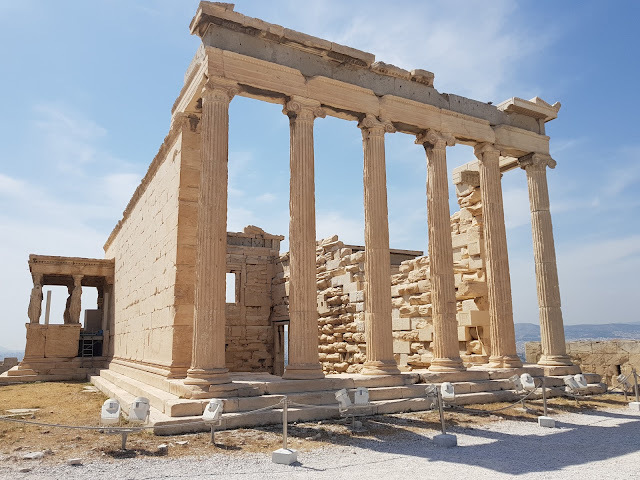 In fact the pathway started outside our hotel and proceeded up the hill to The Acropolis and the Parthenon and then back down the other side where you fine the acropolis museum. On our first evening, we came across Beer Time. It was on the Ratebeer list so that's where I was heading and it became our favourite place in Athens. We dropped back a number of times over the two days. 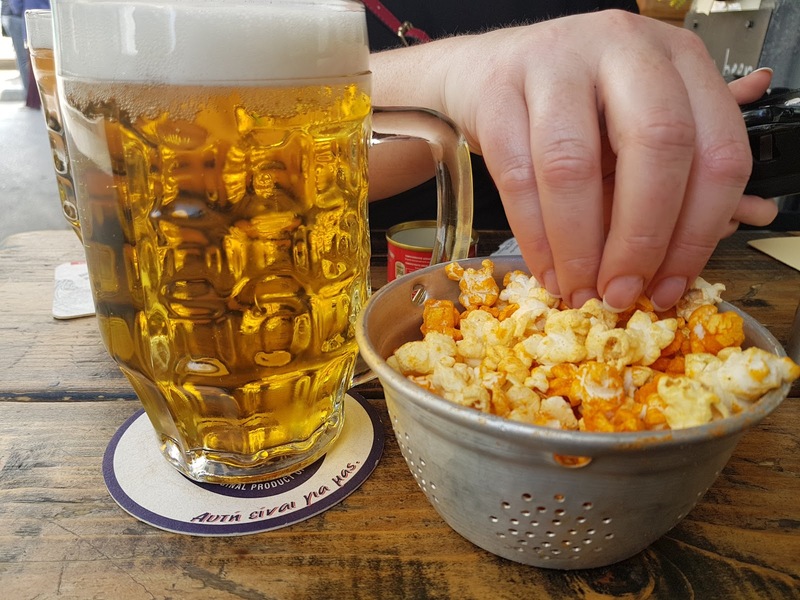 A lot of places give you salty snacks with your beer in Greece and Beertime gave us popcorn which was appreciated. The menu is extensive with plenty of Greek beer available in bottle as well as a few on draught. The Septem beers were pretty good, American style pale ales. It was the draught Zeos beers on the front page we kept going for though. There is a Zeos pilsner which is grand but the two Beertime house beers were excellent. Pauline loved the lager pictured above with the popcorn and I fell in love with the dark lager and had many of them. I also tried some bottled beer along the way but didn't take note of everything as we were on honeymoon after all. 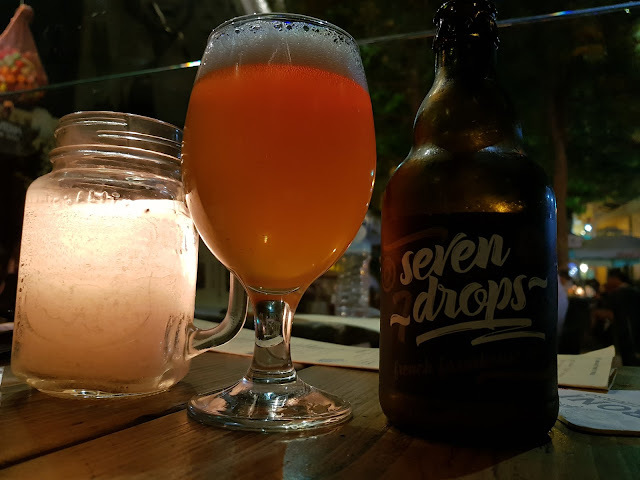 This one in Beer Time was from Seven Island brewing on Corfu and is called Seven Drops saison. It's actually a collaboration with Epirus Brewery. It's aggressively carbonated but ticks all the right boxes for a saison. However after this, I moved back to the house dark lager. I can't talk about Greece without talking about their macro beers such as Alfa above. The main macro beers of Greece are Alfa and Fix as well as Mythos. In Athens, it was mostly Alfa and Fix that I came across and of the two, Alfa was the better option. We had Alfa in a number of places that weren't serving craft beer. In the picture above, it was our last day and we had got on a hop on hop off bus to the harbour area around Piraeus. 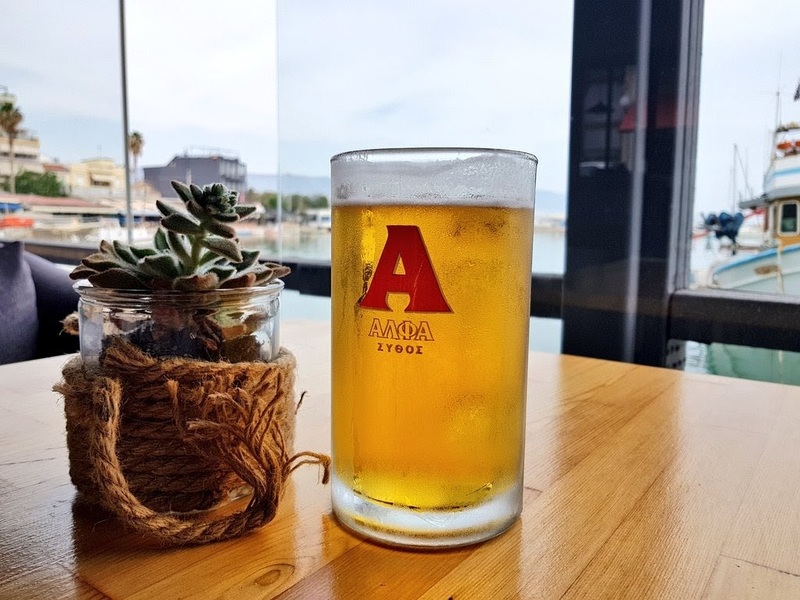 We had lunch there but we had to walk past over a dozen bars and restaurants that were only serving Amstel until we got one serving Alfa at least and that was purely down to the taste of the beer itself rather than who owns it. My first beer in Athens that first afternoon was actually a bottle of Mythos while Pauline had a bottle of Alfa Weiss. We paired that with a prawn cocktail. If I'm honest, the Mythos in the green bottle was nowhere near as good as the Alfa Weiss. That was likely down to it being in a green bottle of course. To be clear though, Alfa is owned by Heineken while Fix and Mythos are owned by Carlsberg. I would later discover that draught Mythos is actually quite tasty when I got to Crete. 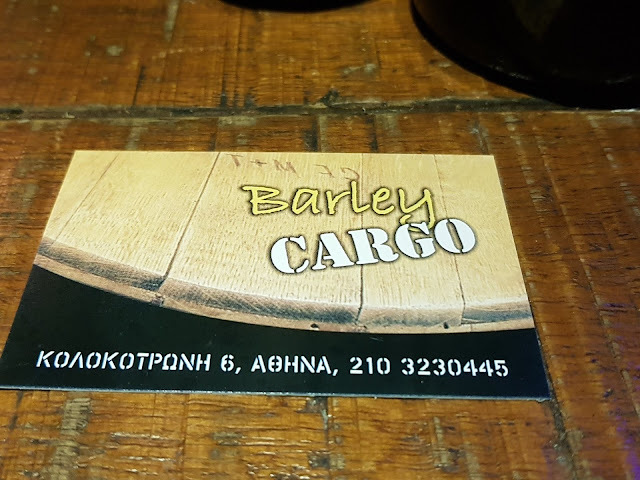 Another good beer bar we came across was Barley Cargo. We hadn't intended on going there, we were just walking around the famous Plaka area when we spotted it and went in and then realised it was one of the better beer bars listed on Ratebeer. 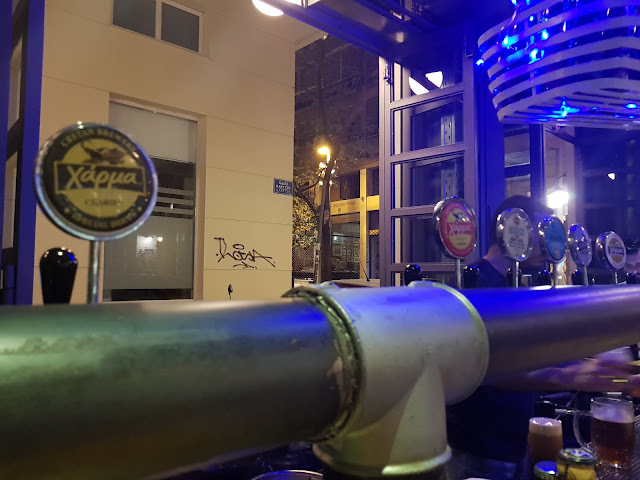 Inside are a number of taps, most of which are from local Greek breweries. The first two on the left are actually from Crete and we were going there the next day so there was no real need to try them but that didn't stop us of course. I'll mention them in the article about Crete though. 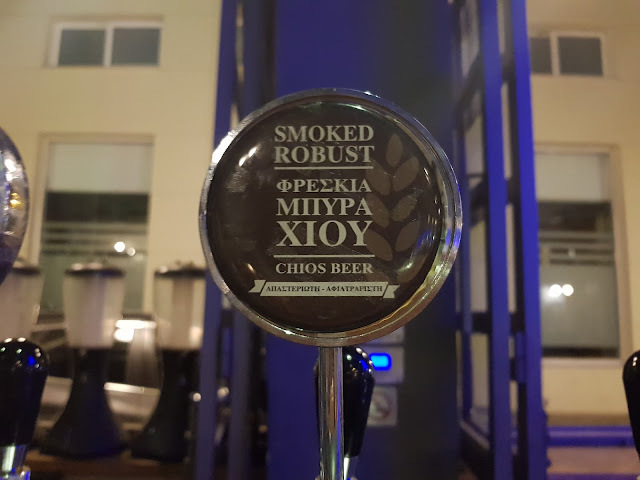 I did order this smoked Robust porter but it was the end of the keg so the barman shrugged his shoulders and gave me a free half glass of beer until I could pick something up. It was a lovely beer though and I would have loved to have a full measure. This is no Bamberg racuhbier though, it's a nice 6.2% porter with a little smoke. 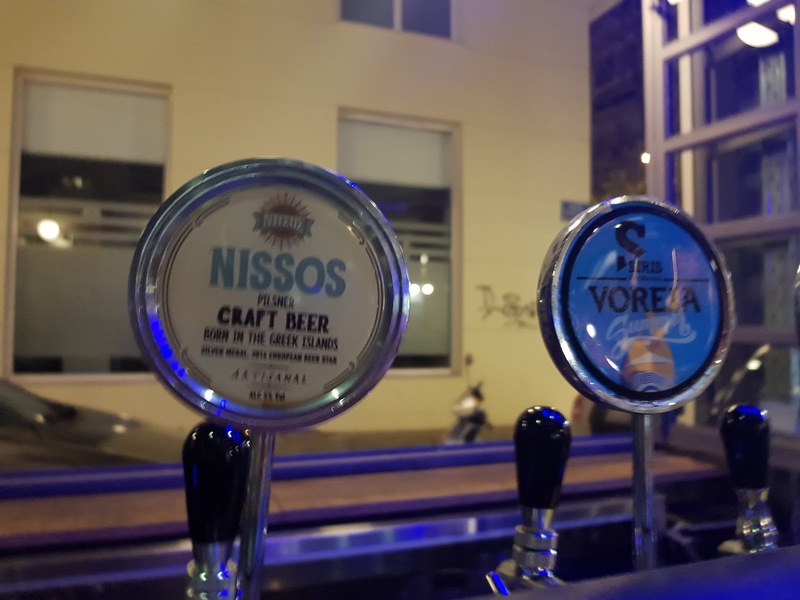 The Nissos Pilsner was very tasty and Pauline really enjoyed it as well as the voreia summer beer I tried. I didn't take any notes in Barley Cargo as to be honest, it was late and my palate was wrecked so I was just there to enjoy the beer. 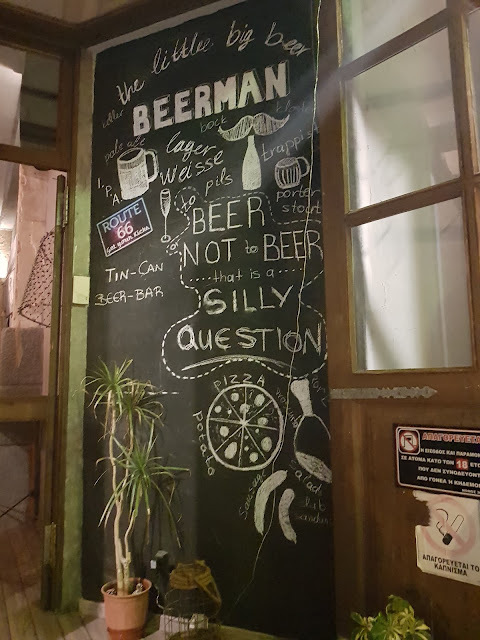 Just across the road from our hotel, I spotted a little bar with a few people seated outside so we went to investigate. It's called Beerman and they have cans of beer stacked outside. There was only one person sitting inside when we went in and it looked like the people outside were the owners and friends. We had a few Greek beers, I don't actually recall which and to be fair, we went there both nights before going to bed as it was a late bar. 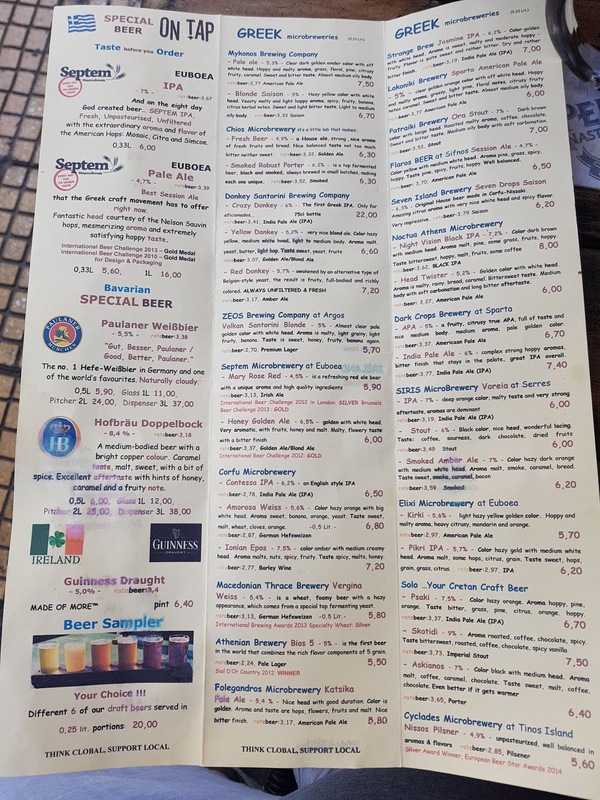 I actually think it's worth exploring properly if you are in Athens though as it had a pretty good bottle menu. Just a note now on Athens as a tourist destination rather than beer. I said above that I felt two days was enough. We don't usually wander around museums because they take so much time, that said, we do visit museums from time to time where we have the extra time. Firstly, the Acropolis and Parthenon are amazing. Even if you don't visit the Parthenon itself, just wandering around the hill itself gives outstanding views of the city and it's rather humbling being around something so ancient and grand. I would however warn that the fee to visit the Parthenon is very expensive in my view. It's a whopping €20 or so per person which seems a lot though I've read (not on the ticket) that it may be valid for 5 days meaning you can visit a few times. This might be useful for photography as you can get different lighting conditions. It also apparently drops to €10 off season which is far more reasonable. Also, the open top bus tour is potentially worth doing but bear in mind that most of the time spent on the bus is spent navigating the narrow streets and traffic. The one I did was City Tours (the red one) and they had a free snack at one of the spots. The Piraeus tour we added on was essentially useless as a tour and only good if you want to visit the harbour itself or get a ferry. The fact is, there's very little to really see in Athens beyond the area around The Acropolis and a few temple areas and all of these are with walking distance of each other. I just wanted to mention the hotel we stayed in. It was called Andromeda Downtown Suites and is located at the start of the hill up The Acropolis and the markets that lead all the way up the hill. The room is lovely and has air conditioning which is necessary. It's also very quiet inside. There's even a roof top area with seats and a pool. Although we didn't bother using the pool, we did use the roof one evening and took in the view with a few beers. One thing to mention is that when we arrived, there was no one at reception and the door was locked. We called the number but we had to Google it on our phones first so if you have no internet available, you might be in trouble. Since Greece is all about the islands, that's where we headed next. A week on the ancient island of Crete was the main part of the honeymoon. I met a guy from Athens at a conference in Edinburgh once. He'd heard that they called Edinburgh "the Athens of the North" and found this very amusing. 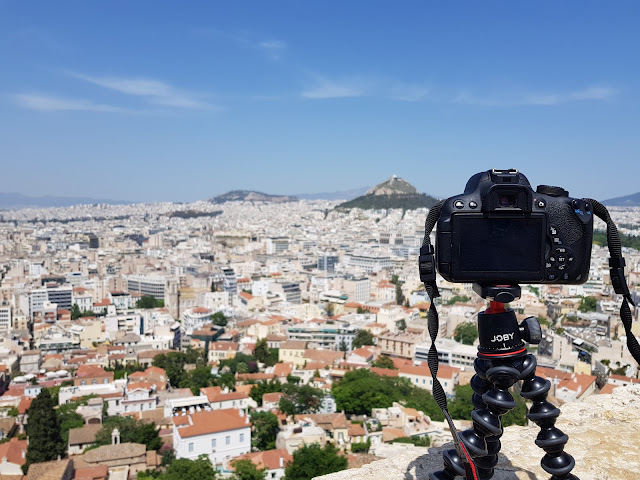 I started to apologise for my British compatriots - "...of course it's nothing like Athens really..." - and he said, "That's right, it's nothing like Athens! In Athens they tear everything down every twenty years or so - they don't care about the past at all!" It's a point of view. Used your info while in Athens. Got some tasty beers in...thanks! 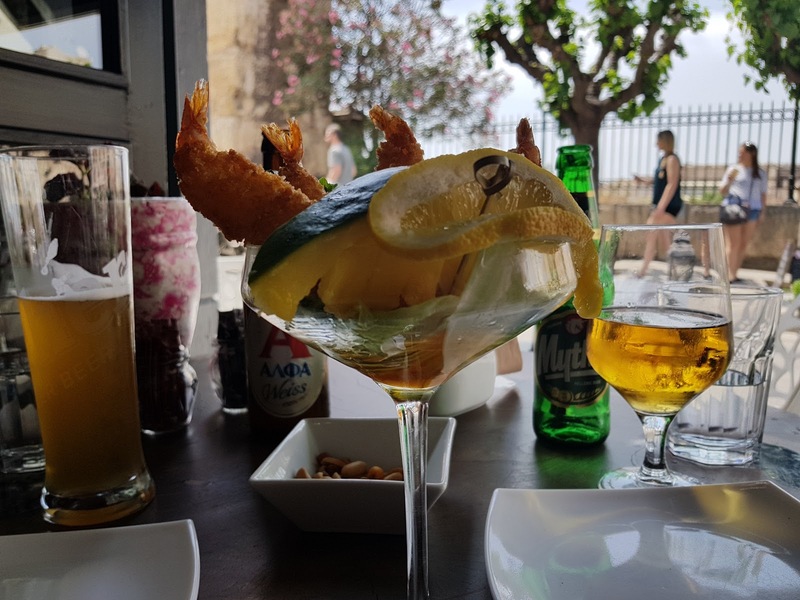 Romance, History, Amazing tourist attraction, Mouth Watering cuisine –Seafood, Pasta,Beers, white-bean soup! Greece offers it all and much more. Thanks to Greece Visa UK for making the cumbersome task of visa application easier for me. I love travelling. Exploring new places is my latest obsession. I have recently been to Dubai and loved the place so much. I was skeptical about the visa process but I got my Dubai Visa online within a day or two and the process was a lot easier than I thought it to be.